Always an A student, I applied myself diligently to the task of understanding what people were trying to tell me about the racist impact of my behavior, which seemed like a fine plan, if in a sisyphean kind of way. 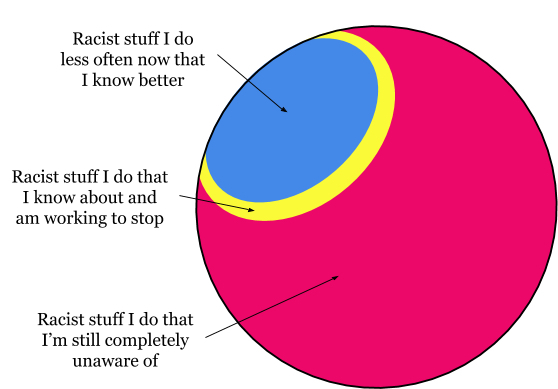 The real problem, for me, was the shame spiral I kept getting caught in as I tried to keep re-conceiving of myself as a more racist person every time I learned about more of my racism. In addition to being a horribly unpleasant experience, spending my time trying to figure out what’s wrong with me or why anyone would want to hang out with such a horrible person as me was getting in the way of learning or growing or transforming (or eating or sleeping) or doing anything else useful. The part that keeps me up at night is the yellow bit—the messed-up parts of me that I just learned about and have not yet managed to transform or heal. When I’m stressing about those, it really helps me to remember that that whole set of things is just my growing learning edge and to recognize and celebrate that every time the yellow band gets bigger it’s because the red is getting smaller. Unknown unknowns are becoming known unknowns, and that’s progress. * I thought about it, and I think what’s happening is that I am learning, and as I am learning I am acting better, and as I am acting better I’m more trustworthy and easier to be around, and so I have more close and trusting relationships with people of color, who then call me on more of my stuff. This is brilliant. I will share widely!